The professional choice for clean auto paint. The McKee's 37 Paint Decontamination System is a three step system that deep cleans auto paint using a specific sequence of surface-safe cleaners. This system eliminates soil and ferrous metals from beneath the paint surface to prevent long-term paint damage. The McKee's 37 Paint Decontamination System is factory authorized and manufacturer approved to deliver a clean, protected vehicle with a glassy smooth finish, while saving time and effort on the part of the detailer. The McKee's 37 Paint Decontamination System was developed as a method of removing paint contamination beyond what can be removed by washing or claying. If you are familiar with detail clay, you know it is capable of removing above surface contaminants that have bonded to the paint. The McKee's 37 Paint Decontamination System is designed to remove what lies below the paint surface. Airborne chemical compounds and ferrous particles - particles containing iron - actually penetrate the paint and create corrosive compounds that eat deep into the paint's sub-layers. This is a gradual process that often is not evident until it's too late. Claying or polishing only removes the particle, not it's effects, which are continuing to spread beneath the surface. The McKee's 37 Paint Decontamination System is a total solution to paint contamination. 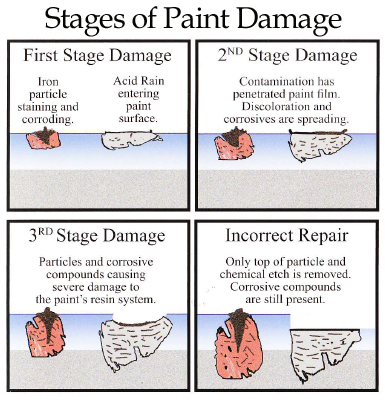 Steps 1-4 are specifically formulated to neutralize and remove contaminants to stop any damage being done to the paint and to prevent future damage. Step 5 McKee's 370 360 Corrects, Cleans, Seals or McKee's 37 Trademark Carnauba Wax seal the paint and forms a anti-static barrier to dust and industrial fallout. Note: Some decontamination procedures include the use of products containing Oxalic Acid. This acid softens the paint, exterior trim, and aluminum. Damage may not be evident for months. The McKee's 37 Paint Decontamination System does not contain Oxalic Acid. In addition, the system protects against the future effects of acid rain, hard water, industrial fallout, and ultraviolet radiation. McKee's 37 Xtreme Foam Formula Auto Shampoo is a fully biodegradable, high-foaming, pH-balanced car soap with inhibitors for safe usage. It removes outer surface dirt, road film, and grime, preparing the surface for step two. McKee's 37 Xtreme Iron Remover is a blend of specially formulated cleaners and inhibitors that actually opens the pores of the paint, allowing the ferrous particles to be removed by agitation. McKee's 37 Xtreme Iron Remover will enter the subsurface of the paint film and neutralize caustic compounds generated by ferrous particles that have penetrated paint film. Use undiluted. Clean paint is essential to a clear, glossy finish. Tiny bumps and grit not only detract from the shine, they indicate a more serious problem: potential oxidation. Removing tiny contaminants from the clear coat will prevent oxidation and enhance the clarity and shine of the wax coat. The only way to achieve this clarity is by using detailing clay. You need McKee’s 37 Wax Remover for Plastic in your detailing arsenal. Whether you only detail your own cars or you detail cars as a business, you know how frustrating it is to remove dried wax, compound or polish residue off of plastic, vinyl and rubber trim. It's a real pain! Guess what? McKee’s 37 Wax Remover for Plastic actually works, so you can feel confident with your purchase! Keep a bottle or two in your cabinet of detailing supplies; you’ll need it sooner or later. Always apply paint protection after using steps 1-3. McKee's 37 360 Corrects, Cleans, Seals is is a revolutionary new product that combines correction, cleaning, and sealing into one simple step. This all-in-one wonder eliminates the need to use a separate mild swirl remover, paint cleanser, and sealant, yet you achieve the same depth, gloss, and slickness! McKee's 37 360™ is total car care made easier. The McKee's 37 Paint Decontamination System is used by body shops for pre-cleaning prior to detailing and by dealerships for new and used car prep. If you are a detailing professional looking for an effective solution to paint contamination, go with the proven science of the McKee's 37 Paint Decontamination System. A total retail value of $91.92. Save $31.93! Federal regulations prohibit the shipment of this product by air.